"...one falls victim to [Noréna's] unique vocal coloring, the exotic middle voice often flowing like citrus-tainted honey (as in the 'Ange adorable' duet of act one). We are compelled to nod appreciatively at her accurate graces as she begins the waltz song and to admire the clean rush of scales which ends the aria....The second act reveals [Hackett's] best qualities. He begins (and ends) the act with exquisite mezza voce effects....The apostrophe which concludes the act is the high point of his performance; with Gigli-like sweetness of tone, he sustains the dreamy atmosphere of night by weighting the reiterated C's. (One remembers that Sun critic W.J. Henderson had compared Hackett in his debut season to Alessandro Bonci.)" 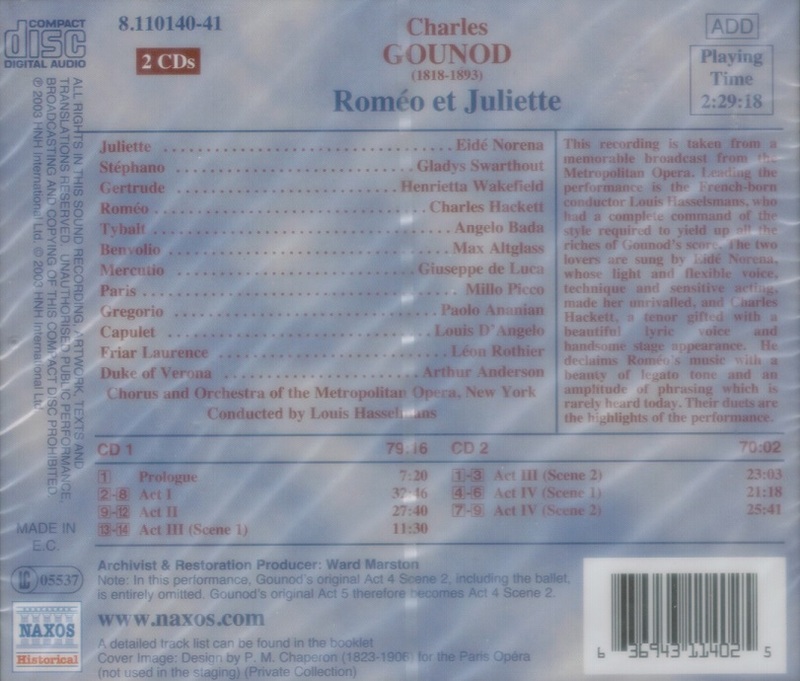 “ROMÉO ET JULIETTE was not recorded during the 78rpm era, so we must rely on Saturday-matinee broadcasts from the Metropolitan Opera where it was a repertoire piece for many years. If we want to hear how it was performed in the heyday of French style, there is only one choice: this broadcast from the l934-35 season. Change was in the air at the Metropolitan, as the long-serving manager Giulio Gatti-Casazza was about to retire, but the structure he had built up, with its fine chorus and orchestra and its excellent supporting singers, was still in place. The cast of our ROMÉO includes one legendary character singer, the tenor Angelo Bada, who had actually come over from Italy with Gatti-Casazza in 1908, and another, the bass Léon Rothier, who had been at the Met since 1910. One of the protagonists, the illustrious baritone Giuseppe de Luca, had adorned the Met stage since 1915. The new generation is represented by the mezzo Gladys Swarthout. 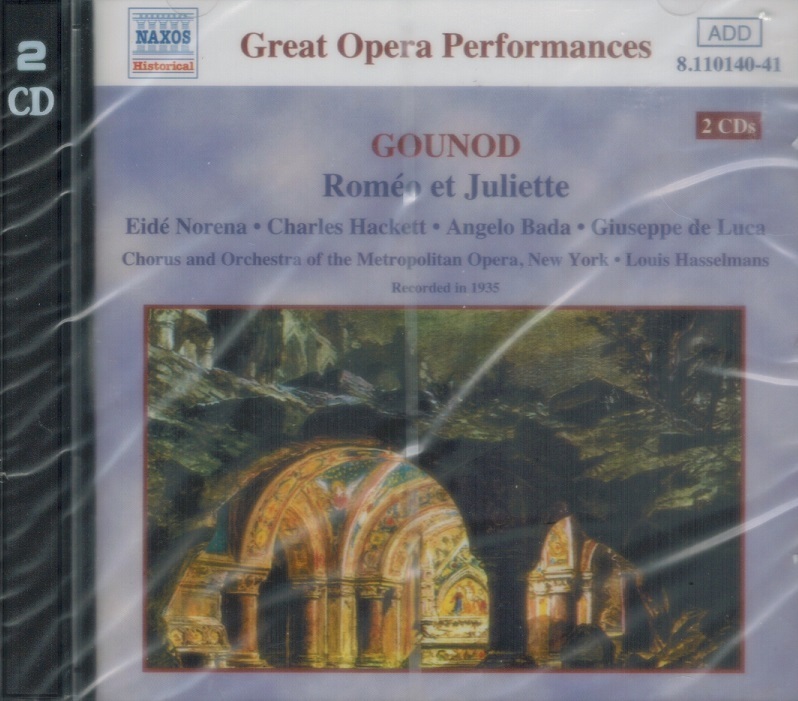 What makes this recording special, apart from the still vibrant de Luca and the sonorous Rothier, is the singing of the tenor and soprano and the superbly stylish conducting. Noréna characterizes Juliette as a real teenager: her singing is full of wide-eyed wonder and hope until the tragic dénouement. 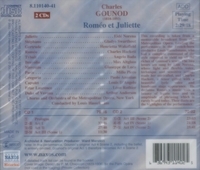 Hackett declaims Roméo's music with a beauty of legato tone and an amplitude of phrasing which is rarely heard today. Their duets are the highlights of the performance, which is as it should be. In the pit is the masterly Louis Hasselmans. Listen to how beautifully he and the orchestra phrase the opening bars of Act II. An incidental pleasure is the commentary of Milton Cross, with his inevitable mention of the afternoon's sponsor. Louis Hasselmans, born in Paris on 15 July 1878, made his mark as a cellist,taking a first prize at the Conservatoire in 1893. He was principal of the Concerts Lamoureux and a member of the celebrated Quatuor Capet before turning to conducting. From 1909 to 1911 he was at the Opéra-Comique, and again in 1919-22, in Montréal in 1911-13, and at the Chicago Civic Opera, 1918-19. He was a close friend and colleague of Gabriel Fauré. In 1913 he conducted the first Paris performance of PÉNÉLOPE and four years later Fauré dedicated his First Cello Sonata to him. Hasselmans first conducted at the Met on 20 January, 1922 (FAUST) and stayed for fifteen seasons, giving 378 performances of fourteen French operas including the Met premiers of PELLÉAS ET MÉLISANDE, L'HEURE ESPAGNOLE and DON QUICHOTTE. He died at San Juan, Puerto Rico, on 27 December, 1957. Eide Noréna was born Karolina Hansen at Horten, Norway, on 26 April 1884, and studied with Ellen Gulbranson in Oslo. Having started as a concert singer in 1904, she made her operatic début in Oslo in 1907. In 1909 she married the actor Egel Naess Eide and began calling herself Kaja Eide, belatedly starting an international career as Eide Noréna. She became a byword for style in the Franco-Belgian repertoire - from 1928 she lived in Paris and was a favourite at the Opéra. She had only a few seasons at the Met. She died in Lausanne, Switzerland, on 19 November 1968. Noréna made beautiful records of French and Italian repertoire. Gladys Swarthout was born at Deepwater, Missouri, on Christmas Day 1900, and studied in Chicago where she made her début at the Civic Opera in 1924. Her Met début came on 15 November 1929 as La Cieca in a matinee of LA GIOCONDA, and in thirteen seasons she sang 22 roles. Her good figure made her an asset in travesty roles and in the 1930s she became a popular film star, renowned as one of America's best-dressed women. Her most famous stage role was Carmen. The last years of her career were affected by heart trouble and in 1954 she retired to Florence, where she died on 7 July, 1969.